The July 4th travel ‘season’ is evidently already underway, as airports around the country have already rolled out their in-terminal holiday celebrations. Orlando International Airport starts celebrating this weekend (Liberty Weekend) with a free concert by the Orlando Philharmonic Orchestra in the Hyatt Regency Hotel atrium (which doubles as the main atrium of the airport) on Saturday, June 29 at 7:45 p.m. The concert is free and in the pre-security area of the airport and everyone who attends will receive American flags, pins and three hours of complimentary parking. Orlando International Airport has another patriotic event underway in the atrium: a display of 50 tempered-glass poppies (The Remembrance Poppies) by Craig Mitchell Smith. Poppies have been the American Legion’s symbol of symbol of tribute to fallen soldiers since World War I.
Miami International Airport also starts celebrating early (this Friday, Saturday, Sunday and again on July 4th) with a parade in the terminals, photo ops with George Washington and other activities. And in Washington, D.C. both Dulles International Airport and Reagan National Airport are running a fun promotion with President Obama. (Well, a cardboard cut-out of the president). Starting today and running through July 7th, there will be red, white and blue menus at many airport restaurants, patriotic displays in the shops and a fun photo contest called #BumpedIntoObama. Look for “the President” outside various shops in either airport (you can find out where he is by checking the IAD and DCA social media sites); get your picture taken with him, share the photo on Twitter or Instagram (@IADFoodandShops or @DCAFoodandShops) with the hashtag #BumpedIntoObama and you’ll not only have a fun souvenir – you’ll be entered into a daily drawing for a $25 Gift Card. 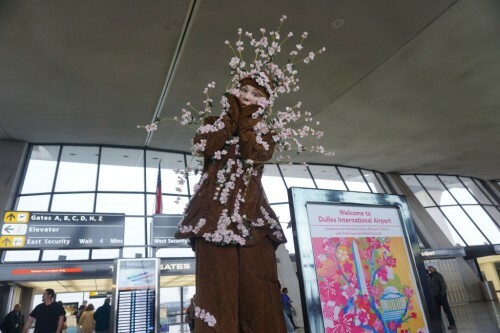 The National Cherry Blossom Festival is underway in Washington, D.C. The National Park Service horticulturists have been monitoring the blossoms of the Yoshino cherry trees that surround the Tidal Basin for peak bud opening and they say right about now is a good time to pay a visit. It’s also a good time to visit Washington’s Dulles or Reagan National Airports. They are featuring Cherry Blossom-themed cocktails, food, banners and displays, including cherry blossom shirts and handbags, cherry blossom pink martinis, donuts with cherry blossom pink frosting and cherry blossom nail designs. Need more pink? Reagan National Airport has pink lighting shining through the glass block walls in the stairwells in the parking garages and banners out front.